No more tight skin, shampoo that won’t foam, white traces on the taps in the bathroom, washing machine that fails too soon and no more exploding energy bills. All these unpleasant surprises have a single cause : limescale in tap water. There is a reliable, simple, and economic solution to eliminate all these unpleasant surprises in the long term : a water softener. The operation of the water softener is based on the principle of ion exchange that substitutes highly soluble sodium ions for calcium and magnesium ions by passing through an appropriate resin. Limescale in the water is then eliminated and the result is called softened water. Pipe corrosion may be due to several causes : electrochemical, chemical, bacterial and/or mechanical. It is an illusion to think that limescale protects your pipes against all these forms of corrosion. In all cases, corrosion continues to develop under the layer of limescale, which systematically requires the use of suitable protection treatments or systems (such as anodes) to protect against corrosion. Residual bacteria in a water softener through which water circulates regularly do not introduce any risks for human health. Even better, by avoiding scaling, softened water is a preventive treatment against some serious bacteria, such as legionella, that takes refuge in scale. Simply check that your water softener is adjusted correctly (particularly for regeneration cycles) and that maintenance is carried out every year, to assure sanitary safety of your installation. Yes, and in more than one way ! First, scale deposits in pipes, heating equipments, and household appliances increase energy consumption*. By optimising the operation of your installations, softened water helps to control your energy bill and extends the life of your appliances. Furthermore, using a water softener is kinder to the environment because softening water means that you can use less shampoo, soap and detergents which can contribute to reducing detergents discharge into the ground and water tables. Water softener also eliminates the need for anti-scale products with some deemed to be noxious. * Source ADEME (French organisation) – “Domestic hot water in private homes" – February 1991. Corrosiveness is the power to dissolve metal in water ; aggressiveness is the power to dissolve calcium in water. Softening water has no influence on either of these two properties. In particular, it does not dissolve calcium but it exchanges calcium and magnesium ions in water by sodium ions. * DGS circular No. 2000-166 March 28 2000 dealing with water treatment products and processes for human consumption. Calcium is a mineral present in many food products (dairy products, vegetables, dried fruits, etc.). Therefore, a balanced diet satisfies all the body’s calcium needs even if there is no calcium in the drinking water. French and European regulations do not impose any minimum content of calcium in softened drinking water. The salty taste is the result of a combination of chloride and sodium present in table salt (sodium chloride). Only the sodium content in softened water increases slightly (4.6 mg / L of water added to soften by 1°f TH). The chloride content remains unchanged. Contact your dealer if your water taste changes. TH is a measure of total water hardness. It represents the quantity of calcium and magnesium in water. The higher the value is, the harder the water will be. This measurement is expressed in French degrees (°f), and there is no minimum TH limit required for human consumption water. pH is the hydrogen potential of water, in other words, the quantity of H+ (acid) and OH- (base) in water. The pH value of water is measured on a scale from 0 (acid water) to 14 (basic water). The pH of drinking water, like softened water, should be between 6,5 and 8,5. A suitably sized, well-adjusted, and regularly maintained water softener releases between 5 to 8 m3 of water per year into the drain, for an average home consumption of 200 m3. Therefore, as a maximum, this release is only about 4% of the additional water consumption which costs less than 30 euros per year. HOW TO RECOGNISE A WATER SOFTENER THAT COMPLY WITH REGULATIONS ? Check with your professional to make sure that the proposed water softener benefits from a Health Compliance Certificate (French regulation called “ACS – Autorisation de Conformité Sanitaire -“). Make sure that ion exchange resins are approved by the French Ministry of Health for food application. This is necessary because they filter drinking water. *An up-to-date list of organic materials and objects with an ACS is available on the Ministry of Health site. There is no reason why cold water should not be softened in a private home. A correctly sized water softener, if it is well installed and maintained, does not modify the drinkability of supplied water. Furthermore, although cold water deposits less scale than hot water, most domestic appliances that require heated water are connected to cold water. Regulations do not require that any residual hardness should be maintained. However, the maximum content of sodium in drinking water needs to be considered, and is directly related to the degree of softening (softening by 1°f TH adds an average of 4.6 mg of sodium per litre). Only a qualified installer will be able to advise you and work with you to determine the softening threshold, at your request. He should also take into account specifications of your installation (nature of pipes, design of your installation, etc.). Regenerating salt for domestic water softeners is usually in form of pellets. To get a good regeneration quality, a salt must satisfy chemical and physical quality criteria and must be pure. The quality of a regenerating salt is guaranteed if it complies with standard NF EN 973. Some regenerating salts have also received the NF label that guarantees high quality (French standard). Potassium Chloride may be used in most systems, but requires professional calibration. 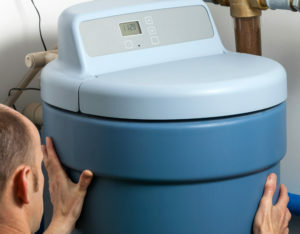 Like a boiler, a water softener in a private home must receive regular maintenance at least once every year. The technician will verify input data in the water softener electronics, clean the brine tank, clean the resin, and make an hydraulic test on the cycles. The purpose of this annual inspection is to prevent damage to the unit, to guarantee correct operation throughout the year, and to maintain bacteriological quality of the drinking water entering into the water softener. Pre-filtration cartridges must be replaced and/or salt must be replenished differently depending on the type of water softener and at regular intervals recommended by the water softener manufacturer. They have all agreed to abide by UAE’s Code of Ethics*. A water softener allows optimal functioning and increases the lifespan of my pipework, taps, boiler, washing machine, kettle, coffee maker, etc. I also use less soap, shampoo, moisturiser, detergent and softener. Thanks to the water softener, my energy consumption does not increase. I replace my domestic appliances less often and I discharge less detergent into nature while reducing the amount I use. With softened water, my hair is silkier, my laundry is softer, and my skin is softer too.